Alphacool CKC is a specific high-efficiency coolant that matches to materials and elements used for PC water coolings.CKC is based on materials whose usabilitiy has been proved and tested in industrial application for many years. The outcome of this is a fully developed product in a new field of application. 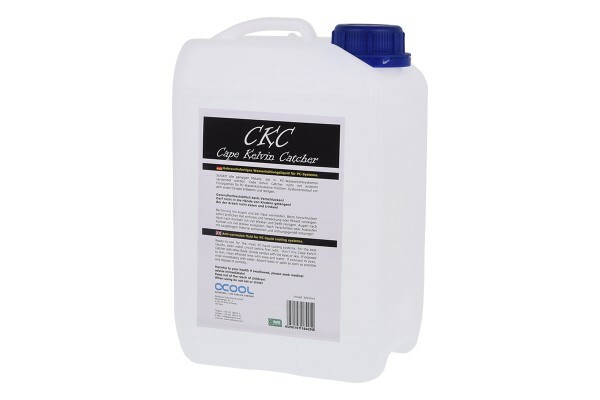 CKC contains a specific and highly effective copper-anticorrosive without including ingredients such as ethylene glycol, ethanediol or similar additives, provides full heat capacity of water, eliminates and reduces algae and bacterial growth and contains further corrosion inhibitors. Alphacool CKC has the ability to conserve full heat capacity of water. It doesn't contain typical antifreezer, but can be mixed with them. Coolants that base upon antifreezer are not allowed to contain less than 25 per cent of antifreeze in order to eliminate algae and bacterial growth which are responsible for reducing heat capacity. CKC is compatible with copper, brass, coatings of nickel, chrome platings, anodising (coated) aluminium, plexiglass (PMMA), POM and synthetic materials for pump bodies such as PPS-GF40 (Laing DDC ® etc.) as well as PUR-, PVC- Tygon®, Masterkleer® hoses. Take note of usual precautions in working with chemical products! Hi, Habe Norprene Schläuche, DC260 Pumpe, Alphacool Radis (UT60 120 & 280, ST 30 420 & 140, alle gespült, mehrfach), Heatkiller 4 und EKWB für ne GTX 980. Achja und noch einen Aqualis mit Borsilikatglas (die einzig einsehbare Stelle im System). CKC verfärbt sich bei mir nach 5 Monaten blau - woran könnte das liegen? Können Sie uns bitte mal ein Foto per Email an info@aquatuning.de schicken? kann man CKC einfärben, mit zum Beispiel Wasserzusatz UV Green (FluoProtect, hier aus dem Shop) oder sollte man das vermeiden? Sie können beides Problemlos mischen.